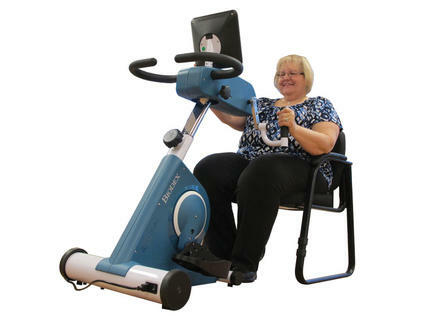 The medBike requires minimal space and is ideal for clinic or home exercise. 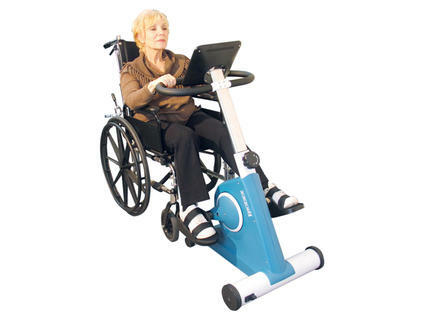 Designed for people with physical limitations, medBike® enables both upper and lower movement training in one compact device. 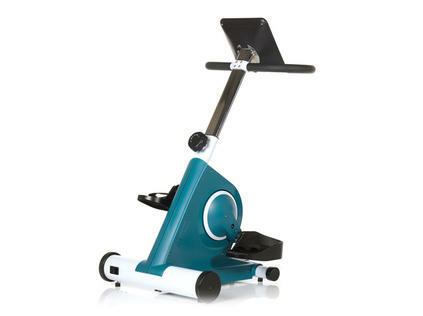 Users can access forward and reverse pedaling in three modes of customizable exercise: Active, Passive and Pedal Assisted mode. The Continuous Control System in Pedal Assisted mode measures strength of user’s input and assists with the rotational movement when needed. Simple operation supports independent use in the home, or in clinical settings. Upper body trainer swivels into place with a simple twist/turn knob. Height adjustment is fast and easy for any individual. 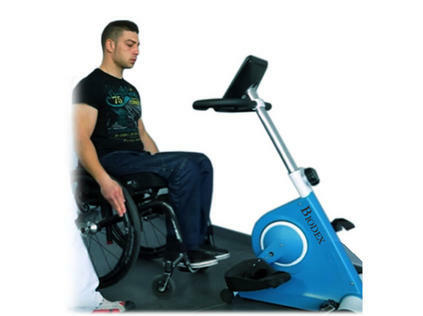 The open design offers comfortable access when exercising from a chair or wheelchair, allowing for earlier movement training interventions across a range of indications. 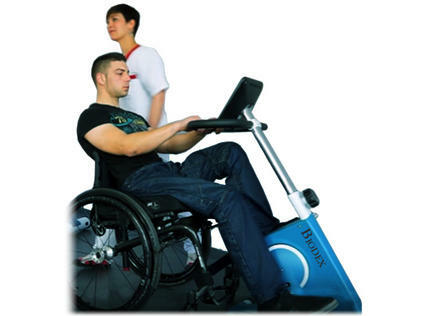 Whether in Active, Passive or Pedal-Assisted mode, users can program an individualized exercise session with specific resistance and time values. Forward and reverse pedaling movement can even be combined into one training session. Individualized training sessions are set using the easy-to-read touch display, and end with a detailed exercise summary. 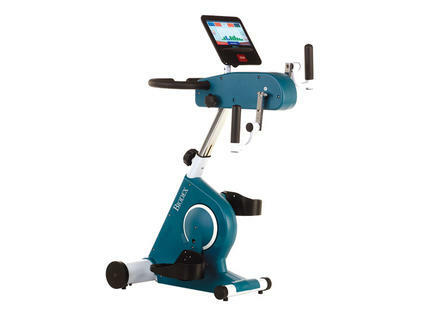 Aging and older adults, and post-acute patients not suited to traditional cycling equipment can exercise safely using the medBike. Wheelchair access, easy-to-understand screen display and simple operation make medBike perfect for both residential and professional use. The Continuous Control System in Pedal-Assisted mode avoids overstraining the lower- and upper-leg muscles, creating safe exercise conditions. Physical therapy patients are seeking additional exercise sessions at gyms and wellness centers. 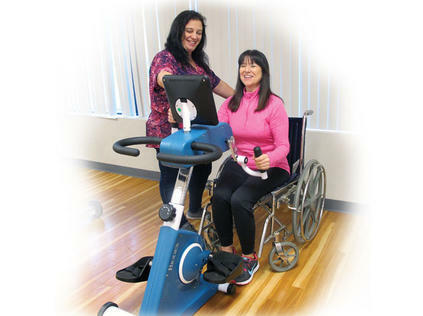 With ease of use, safety features and proven benefits for neurological rehabilitation, equipment like the medBike will help attract members with medical fitness needs. Movement training is effective in assisting neurologic rehabilitation, and repetition is essential for training when brain or nerve damage exists. 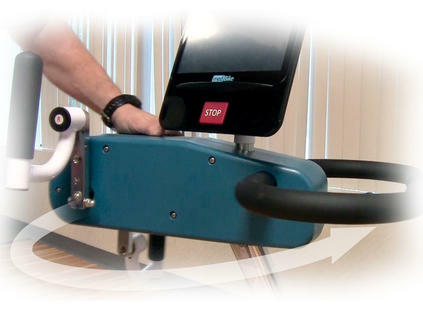 Frequent and regular movement enabled by the medBike helps patients recover some function. In the research, dynamic high cadence cycling showed improved motor function in patients with Parkinson’s (Hoehn and Yahr Scale < 3).1 High-speed, low-resistance cycling elicited significant improvements in the four-square step test and 10m walk test.2 There was a high reliability and adequate sensitivity to detect small to moderate difference in mobility. For people with partial or complete paraplegia of the lower body, lateral control of the lower legs is highly important during motion training to prevent muscle shortening and joint stiffness. To assure a comfortable and correct position, the optional Calf Supports provide safe guidance. 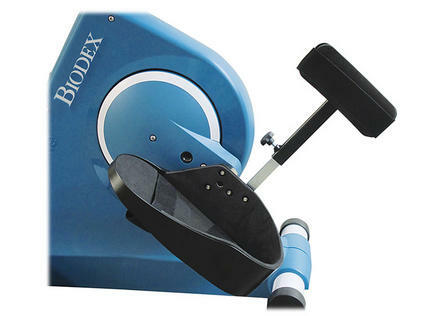 high-speed cycling intervals on bradykinesia in Parkinson's disease. Physiother Theory Pract., 31(2):77-82. The medBike is shipped fully assembled and boxed on a pallet. Follow the instructions outlined in our video to get started. Distributed exclusively by Biodex in the USA & Canada.